Nukli were part of a musical phenomenon that was unique to the 1980s. Their story, like that of many other underground bands of the period, is intertwined with the history of Free Festival culture, a movement that was born in the early '70s as a logical continuation of the '60s psychedelic movement. In the 1980s the Festival scene centred around the Stonehenge Free Festival and later, after the government clamp down, psychedelic venues such as the Crypt and Club Dog in London. Nukli, like many of their peers, became known mainly by word of mouth and through the sale of their cassettes which were sold at gigs, clubs or by mail order. Cassettes became an important format at this time due to the disinterest of the record industry in underground experimental music, and since they were cheap and could easily be played on a cassette recorder in the open air, they were very popular amongst festival go'ers. Along with bands such as The Ozric Tentacles, Oroonies, Ullulators, Webcore, Treatment, Magic Mushroom Band and Mandragora, Nukli followed in the tradition of the 1970s Festival bands, appearing, often free, at Festivals, squats and parties, performing long improvised electronic tinged psychedelic music that incorporated many influences from space rock to reggae. The band, who were based in London, had roots stretching back to the early '80s and were influenced by the likes of late '70s bands Here and Now, Thandoy (later The Karma Kannix a highly influential band who never recorded an album) Sky Whale, Visitor 2035 and the Androids of Mu. Nukli developed out of the Psy band, a sprawling, space punk outfit formed in 1980 by eccentric London guitarist and psychedelic visionary Psi Steve (vocals bass, guitar) together with Mark Huxley (drums), big Chris Gibbs (bass), Cozmik Dave (vocals), and for a while Anthony Hewitt (drums). Steve lived in a weird world of occult philosophy that was part invention and partly based on the Kabbala and which had a black humour that involved reaching "White Light" through atomic armageddon. The band Psy gigged around at parties, squats and the early '80s Stonehenge Festivals and by 1983, Eric Pavlyak had joined on keyboards/synths, Kev Hegan had come in on guitars, flute and sax and Mark had switched from drums to bass. The core of Psy was now Steve, Mark, Kev and Eric, and this central core nucleus became known as The Nukli due to Psi Steve's habit of mixing German and English words together. Psy continued gigging and in 1983 performed at Stonehenge in the Tibetan Mountain Troupe's marquee stage, which graced many early '80s festivals. In 1984 Psy released the track "Sickle And The Hourglass" on a 7" compilation EP called "Stuff The Neighbours" and a cassette entitled "Psychelektra Trip Projekta". This cassette was an extremely weird collection of live jams from 1983, cut ups, sound effects and psychedelic mayhem that became somewhat of a classic on the underground tape circuit. Due to the threat of bootleg copies the cassette has been re-pressed many times since its original release. By 1987 Psi Steve had drifted and the second cassette "Side Effects" was credited to Psy-Nukli . This was an experimental space rock affair, featuring Kev on guitars, Mark on bass/drums and Erik on Synths/drum programming. In 1988 around the time of the release of the retrospective Psy-Nukli tape "No.9", this line-up drafted in Colin Wareham on drums and Julian Done on sax and started gigging around London. 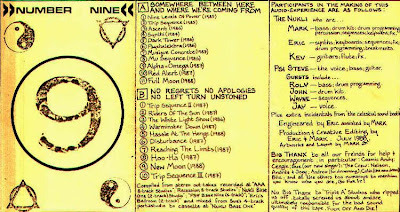 During this mid '80s transitional period both Psy and Nukli were fairly loose aggregations and in addition to the core line up featured a roster of part time members that included Generator John of The Ullulators, Tig and Roly of The Ozrics (who can be heard adding an awesome bassline to a the track Ascent on the No.9 cassette) and Seaweed of The Thunderdogs. The bands often performed at the now legendary Club Dog which was the seed that, under the guidance of Bob and Mike Dog germinated to become the Mega Dog dance organisation and Planet Dog Record label. In late 1988 Nukli had fully split from Psy and by April 1989 had begun recording their first tape with new member Sue Chewter. The resulting At Last is a much more straightforward rock release that includes some cover versions (Zappa's My Guitar Wants To Kill Your Mother and Jefferson Airplane's White Rabbit) as well as some powerful Hillage-like acid rock and stoned jamming. Sue didn't stay long however and shortly after she left the band Mark and Colin started working part time with Dean Carter as his backing band The High Commission. However, Nukli continued to gig and in November 1989 supported Ozric Tentacles at The Rock Garden as part of the first Sonic Relief event. 1990 saw the last gig with Julian and the band worked on the Book Of Changes cassette which was not fully completed due to a break in that resulted in the loss of all of Eric's equipment. Eric had previously lost all of his equipment in when in 1986 a session at AAA studios in London - which comprises the Psychelektra section of this CD - had to be aborted due to theft. Being robbed of everything twice was too much for Eric and he decided to leave for Canada remaining an honorary member of Nukli. Meanwhile Mark and Colin as The High Commission recorded an album with Dean Carter for Demi Monde in April 1990 called Average Man. Both Nukli and Dean Carter and the High Commission played the Torpedo Town Festival, in September of 1991 with Andy Bull taking over Erik's place on keyboards while new member Jamie Bezer came in on vocals and guitar. Andy left a year later in 1992 and a new line-up of Kev, Mark, Colin and Jamie had their gig debut at Club Dog. That same year the band recorded their final tape, the new age space rock response to Acid House Mushroom Bungalow Music In June 1992 after discussions with Delerium Nukli decided to put together an album for release on CD. The band performed at Torpedo Town in August of 1992 one of the last major UK Free Festivals to take place before The Criminal Justice Bill all but destroyed Free Festivals in UK. Shortly afterwards the bands squat home throughout the '80s Nukli base Kontrol, was lost to the authorities, and with no place to rehearse regularly or record the curtain finally came down on the band... but not their music. After much to-ing and fro-ing between UK and Canada the album you hold in your hand was carefully constructed from the various recordings that were made during the bands long and complex career. The result is Nukli's ultimate musical statement, drawing on the essence of freedom and creativity that made the Festival scene so vibrant and refreshing. Throughout the long journey the "Nucleus" held together and the musical creation that has resulted surely contains a thread of freedom and hope stretching back to the late '70s when the whole mad scene first started...... enjoy it, and don't lose your right to party. Very nice and obscure freaked out/space psych from the mid 80s. Great to read what happened to everyone after we all left London. Love to know what they're all up to now. Just to expand the history further backwards, (Big) Chris Gibbs and I met when we were both working on a holiday camp in Cornwall in 1979, and moved to Exeter where we called ourselves Euphoria, playing basically space rock. I was abroad for a while and then rejoined Chris in London who was now with PSI Steve, who may have originally come from Exeter as well, difficult to remember some of the details from those rather psychoactive days. We were squatting next to Sadler's Wells Theatre and used to get complaints from them when they could hear us between acts! A guitarist mate of Julian Dunn's (I think called Cy or Si) played with us for a few weeks too. I think I still have the Pscyhelektra tape somewhere in the attic and the 7" EP, as well as photos of some of the people involved. I saw Big Chris at the last Forest Fayre festival, still playing music. Heady days! thanks for posting this great album - another hidden gem i would otherwise never of had the pleasure of listening to - hope the other tapes turn up soon.